Carlisle roof cupolas are part of Ridge Craft’s Select Series, and at Millworkcity, we’re proud to have a huge selection of these simple, streamlined pieces. Designed for 10/12 roof pitches and ready to install right out of the box, these windowed cupolas are ideal for inexperienced carpenters and seasoned contractors. 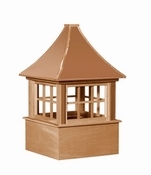 These affordable and attractive Carlisle roof cupolas are a must-have for any project that requires a flair for the finer details. At Millworkcity, it’s our mission to help you pull off the perfect project, and our knowledgeable customer service representatives are always ready to help.